Nils Gunnesson Haal (later ennobled Gyllenhaal) was born on the crown homestead of Hahlegården in Älvsborg län, Västergötland, Sweden, probably at the very beginning of the 17th century. His father was Gunne Olofsson Haal (d. 1634 or 1635), but the identity of his mother is not yet known. Records show that in 1621 Nils was a horseman (ryttare) with the Västgöta cavalry. By 1631 he had risen to the rank of corporal (korpral). By 1640 he had become an officer with the rank of cornett (kornett), and five years later, in 1645, he is listed as a lieutenant (löjtnant). Throughout these years Nils fought in the Thirty Years War (1618-1648), when European countries--including Sweden, Spain, Bohemia, the Netherlands, and the Holy Roman Empire--were embroiled in a continuous war between Catholics and Protestants. Nils served in the battles of Breitenfeld, Lech, Alte Feste, Lützen and Oldendorf. The Battle of Breitenfeld (or Leipzig) on September 17, 1631, broke the strength of revived Catholicism in central Europe. Nils also fought in the wars against Denmark (1643-1645 and 1657-1660) and in the campaign in Bohemia (1648). 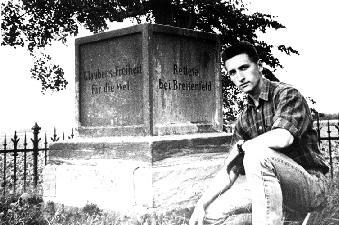 Lars Herman Folke Gyllenhaal, an 8th great-grandson of Nils, visited the battlefield at Breitenfeld in 1991 [see photo below]. As a reward for his military service, on the 20th of December, 1652, Nils Gunnesson Haal was ennobled, granted a coat of arms, and given the surname Gyllenhaal. This turn of events was to have a lasting impact on his descendants, who are to this day part of Sweden's noble estate. (Nobility was never abolished in Sweden as it was in France and Germany, although noble birth no longer results in special political privileges.) According to the Knighthood Letter (adelsbrev) signed by Queen Christina, "the faithful and intrepid Nielss Gunnarsson has from his youth exerted himself and taken pains to grasp the things by means of which he might serve his Sovereign and Country, and has especially trained and permitted himself to be used in war, first abroad and afterwards here within the Country in the last Danish conflict wherein he has conducted himself truly bravely and zealously, so that his commanders give him particular testimony of this." As a fief Nils was given some crown homesteads in the Kullings hundreds, Hahlegården being among them. He was introduced at the House of Nobles in 1672 under the name of Gyllenhaal (Nr 814), and was discharged from the military that same year. Little else is known of the events of his life, with the exception of a single incident in 1655. It is recorded that in this year Nils killed his neighbor, lieutenant Jakob Gyllengren of Guntorp, in a duel. After the duel Nils fled to Denmark, but he was later given a royal pardon. Records from the trial that followed have survived and are available at Göta Hovrätt in Jönköping. They indicate that Nils had been put into prison for a time, but that later he only had to pay half the usual fine for manslaughter because Jakob himself had started the quarrel. Records also indicate that problems arose in the Gyllengren family about how to distribute the money. Artifacts related to this tragic event have survived and are hanging on the walls of the nearby Bråttensby Church. 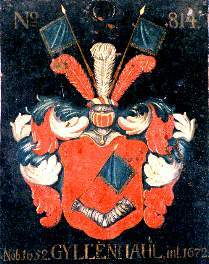 There are two begravningsvapen ("funerary coats of arms") hanging on the walls of the church, both of which apparently belonged to Lieutenant Jakob Gyllengren of Guntorp. One of Jakob's begravningsvapen hangs on the east side of the north wall. 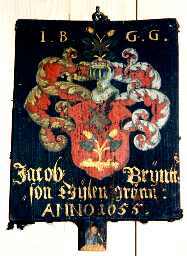 It is a simple wooden board painted with his coat of arms, along with this inscription: "Jakob Bryntteson Gyllengrönn, year 1655" [see photo below]. It has probably been hanging on the wall of the church ever since Jakob's funeral. Undoubtedly this memorial helped keep alive some memory of the event long after Nils and Jakob were gone. Another begravningsvapen that may have belonged to Jakob hangs on the south wall of the church. It is sculpted in wood with the Gyllengren coat of arms, but the inscription, which says simply "I. B. Gylengrönn," has probably been repainted. But what is most interesting about this object is what is hanging beside it. 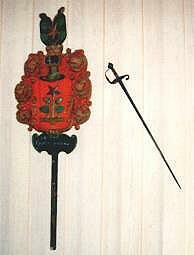 An ancient sword hangs beside Jakob Gyllengren's begravningsvapen [see photo below]. The residents of Bråttensby believe it to be the one that Nils Gyllenhaal used to kill Jakob during the duel. Exactly when the sword was placed in the church is not known, but at a certain point it was regarded to have magical powers. The parishioners believed that it had the power to cure illness, and it was therefore often taken from the church. A piece of cloth that was pulled through the handle could be wrapped around a child to heal his sickness. As for whether or not the sword that hangs in Bråttensby Church is really the one used by Nils Gyllenhaal in the duel, we will probably never know for sure. Certainly the event would have had a great impact on the local people, and they would have had plenty of reason to keep it. It is known that the Gyllenhaals lived on the family homestead known as Hahlegården, also called Haragården. These place names are no longer known in the area, and they do not appear on modern maps. But when Lars Herman Gyllenhaal (d. 1957) visited the area in 1927, a local resident told them that in his youth the name Haragården had still been known (the redident was about 60 in 1927). 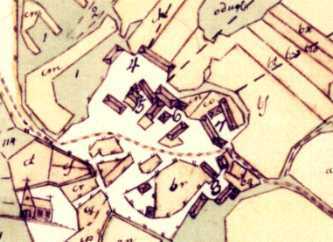 He indicated that the site of old Hahlegården/ Haragården was to the east of the church ruins, just across the road. Recent research seems to confirm this. Olle Gyllenhaal (grandson of Lars Herman) has located an old map of the area dating to 1782 and 1783, not too long after the Gyllenhaals lived there. According to the map, the Hahlegården homestead (which was also called "stommen" in those days) was part of the small village of Härene, located across the old road to the northeast of the Härene Church [see map below]. Stommen or Hahlegården is indicated on the map with the number 6. The old village of Härene was broken up in 1872 in order to improve agricultural production in the area, and today there are no remains left of it. Nils married Märta Hierta, the daughter of Lars Hierta, a captain in the cavalry, and Anna Lilliebielke. They had three sons and two daughters. Those who bear the name Gyllenhaal today are either descended from their middle son, Lars, or their youngest son, Hans. The Gyllenhaals descended from Lars still live in Sweden, but all the Gyllenhaals descended from Hans now live in the U.S.A.
Nils Gunnesson Gyllenhaal died in 1680 or 1681. His wife Märta continued on at Hahlegården after his death until she herself died in 1697. The two were buried together in Härene Church cemetery, although their gravestones are no longer visible.